Mrs. Green's Blog: Such a good story! 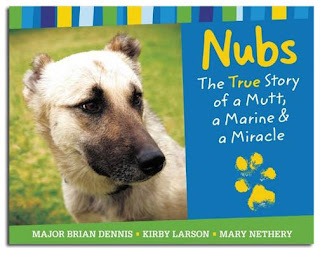 In all the libraries, we just got a new book called Nubs: the true story of a mutt, a Marine, & a miracle. It's written by Major Brian Dennis. It is such a sweet story! This man is a Marine that was sent to Iraq. While he was there, a dog became his friend. This dog went to amazing lengths to be with him. Eventually Major Dennis was able to send Nubs home to the United States to become his pet. This story is truly amazing and it's not all that long! Try it out! Here's a website about Nubs and the book if you want to check it out! 2010 Newbery and Caldecott Winners announced! Do you know who Madonna is?? ?